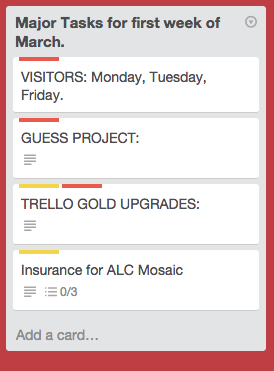 The photo is of my Trello column: “Major tasks for the first week of March”. The visitors were a general success, despite a couple cancelations. Trello upgrades happened — Nancy and I reorganized all the boards into two organizations and upgraded to business class so we can export all data to spreadsheets. I feel good about having that done so that the trello data is easier to fetch and sort. Insurance or Mosaic is still incomplete. I contacted a bunch of brokers, but communications have stalled out, so I need to put out some more feelers and keep that process moving. Project Guess got introduced this week and that is something I’m stoked about. Next week I will schedule a day to go out and take a bunch of photos for the next month or so and we will officially launch on March 13th. The challenge I’ve set is to get up to 1,000 followers by April 30th. Beyond these focus items, I spent some time working on ALF Summer housing, field tripping with students, Admissions communications and organization for upcoming PINs and visiting weeks, I played around with Habit RPG a little, held a half-canceled PIN, had dinner with @ericf, and took care of a bunch of bills and little admin tasks. I’m sad @nancy leaves tomorrow, but plan to enjoy our last day together here in NYC! I’m so grateful I get to do meaningful work that I’m so passionate about and that I get to work with so many amazing people! !